Market squid are known in California as the state's largest fishery and as the basis for those little fried calamari rings. New research, published October 1 in the Journal of Experimental Biology, shows that they may also have something to offer the engineering sector: skin cells that can switch between transparent and white. Humans could use these cells to develop new bio-inspired materials; squid probably use them for cross-dressing. Danny DeMartini, a graduate student at the University of California, Santa Barbara, and lead author of the study, started out working on a kind of cell called an iridocyte. As the name implies, these cells produce iridescent colors, like beetle wings or a peacock tail. 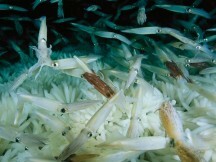 But squid iridocytes are adaptive--unlike other animals, the squid can actively control their hue and brightness. 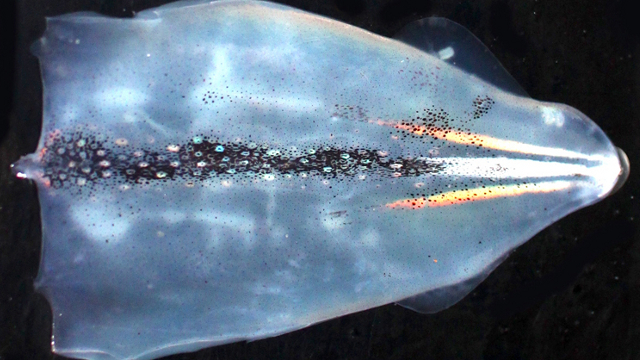 DeMartini's work took a leap forward when he noticed that female market squid have an unusually bright stripe of iridocytes on each side of their body. 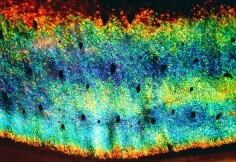 The super-bright cells from this stripe were easier to study, and he was able to determine the specific proteins that permit adaptive color-changing. Then he noticed that the female squid also had a white stripe on their backs, composed of leucophores--a kind of skin cell that scientists always considered to be statically white. But DeMartini found that they contained the same proteins he'd identified in the iridocytes. "I went home fairly depressed that day," he says. If these proteins were present in supposedly static cells, then how could they be the key to changing color, as he'd thought? "Then I began to wonder if leucophores are adaptive. And in fact they are." He went on to discover that leucophores and iridocytes use the same proteins in different ways. Iridocytes pack theirs into folds in the cell membrane. When the squid's brain sends a signal, the proteins condense, drawing the folds closer. The distance between the folds determines the wavelength of light reflected, allowing iridocytes to "tune" their color from red to blue. Meanwhile, leucophores keep their proteins in membrane-enclosed spheres of many sizes. Before the signal to condense, the proteins are too dispersed to reflect light, and the leucophore is transparent. After condensation, the assorted spheres reflect all available wavelengths, making the leucophore appear white. Market squid mating and spawning party. I mean aggregation. Credit: Jesse Claggett. Such sophisticated color-changing abilities tempt imitation. Military applications are particularly obvious, and indeed, DeMartini's work is funded by a Navy grant, though he says, "I don't think we're going to be stapling squid skin to soldiers anytime soon." He also points out that the principles being discovered could find use in fields such as optical communication. What about applications for the squid themselves? Why are the switchable white cells only found in females? Definitive answers await behavioral studies, but DeMartini theorizes that the white and rainbow stripes together could mimic the appearance of a male squid's testis. This option would give females a tool (ahem) for discouraging unwanted attention.